Mmmmm. Bacon on a stick! Oh my. While teaching my daughter about del.icio.us this evening, I happened to run across this site: www.lollyphile.com/index.php. 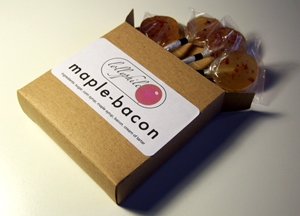 Based out of San Francisco, these folks have taken two American food institutions — lollipops and bacon — and mixed them together to create a wondrous product for 2008: Maple Bacon Lollipops. With real bits of meat mixed in for texture (!). Tapping into our love of gag gifts and quirky desserts (not to mention our memories of how great the bacon tasted when it touched the maple syrup on our breakfast plates at the IHOP oh-so-many years ago . . .), this is a product ripe to take off. It’s perfect fodder for general media stories, blogs, tags (who wouldn’t love to put “bacon” and “candy” in the same search string?) and Food Channel addicts like me. Further, this is smart marketing. Read the site copy and tell me you don’t want to send these guys some money, even if the thought of bacon bits on a stick nauseates you (hey, would make a great gift for that twit of a cubicle mate you have). If Lollyphile handles their promotion right, they have a great chance of having their pops park in the mouths of thousands around the globe. Bacon and lollipops. Talk about obvious.